I grew up (well, my first 10 years) at 127 Paddock St. and attended Congress School in "East Hills", although I never recall it being referred to as that. We always said we lived near the intersection of Lake Drive and Cherry or Diamond and Lake Dr. or across the street from the "Priests' House". I no longer live in Michigan but get back to visit family and have noticed the renovation of buildings and businesses along those main streets, but the homes, including the one I lived in, look pretty dismal. I've thought about buying up the old place and maybe next door, too, and fixing them up. Just a thought at this point, but I have to believe developers or private individuals have already thought about that and maybe redevelopment of the housing in East Hills is already in the works. Can anyone tell me anything about this issue? I live in/own a duplex on Warren, which dead ends into Cherry just west of Diamond. About 2/3 of the homes on the street have been brought back to life, at least to an extent. This is due, in part, to the somewhat recent historical designation (Farimount Square Historic District). There are dumpsters throughout the neighborhood, and there is significant investment in housing in the area by various developers. I think that it is improving, and will continue to improve for awhile. Some spots, like Paddock, which is more narrow/alley feeling, tend to lag slightly behind (but they'll get there). Wow, the Priest's house. You must have been there pre-1982 when Guy bought the home and turned it into Gibsons. Paddock is mostly rental housing these days. The house that is directly behind our East Hills Center building is rental. Our staff carpenter used to own the red house on Paddock but recently sold it to a landlord for rentals. I don't believe there are a lot of owner-occupied houses on that street. That doesn't mean they are selling cheap though. Even in the condition they are in you are going to pay $110k-120K. Anyway, it's good to see the neighborhood rejuvenate, but some of those houses look sad. Maybe a few are better inside than they appear outside. The prices do sound a little high for what they look like, but considering their location, it sounds like there are pressures to increase their values. But personally, I'd want to do something to make them better on the outside, too. I don't think these home qualify for historic designation???? Although I don't live in the neighborhood, I kind of like the greenspace that Congress provides in that area. Personally, I think any redevelopment (if it ever occurred) should preserve a lot of that, much like what ICCF is doing on Cherry (or moreso). 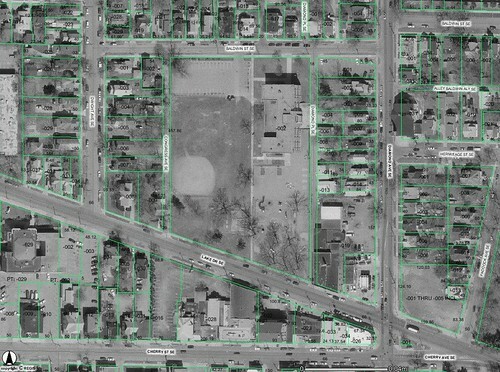 The Iroqouis plan is intriguing, but yeah you'd have to load those townhomes up with brick and ornamentation to get them to flow in the Ottawa Hills neighborhood, and to pair well with the school. What area does the Fairmount Square Historic District cover? This is a bit off-topic, but you mentioned Congress Elementary. GRPS considered closing Congress Elementary a few years ago, along with a few other schools. 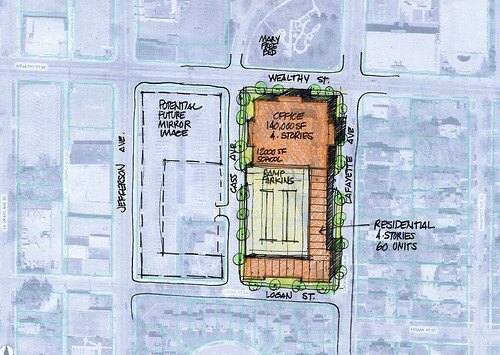 It would be a great property for redevelopment. Call me when you're ready to sell Lighthouse Dave. Congress is a neighborhood school and hopefully will remain a neighborhood school. When they did try to close it, the neighborhood association & the school launched a "Save Congress School" campaign, which helped save the school. Also if legend has it right, if Ottawa Elementary goes up for sale, the OHNA has an equal vote on what happens to the property. 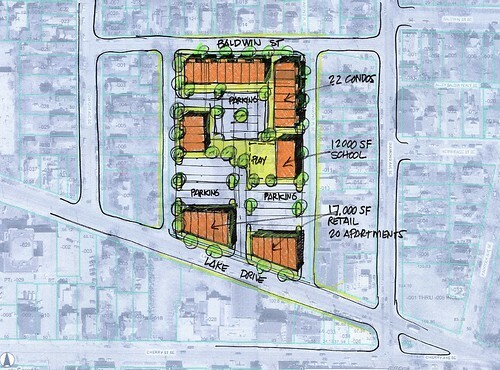 Is the 920 Cherry housing development dead? Why no mention of that project as new housing development? I see what you are saying about the state of the housing stock in some of these great neighborhoods. Even in my old neck of the woods on the NE side I am seeing sign of decline. In the case of these older neighborhoods, like East Hills and Easttown, I think there is sufficient argument to make them historic districts. 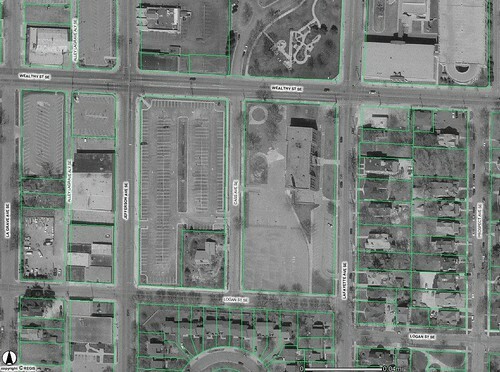 The Fairmount Square Historic District is very small, and doesn't cover much of this area. I think I should be expanded. When Heritage Hill and Cherry Hill where designated historic, property values rose and crime declined. In addition, the designation gives people historic tax credits to fix up their homes. Absentee landlords don't like the restrictions of historic districts and move, many times opening these homes up for single family use. Yes, many argue that making an area a historic district takes owners rights away, but I think the good out weighs the bad. with the potential to mirror the concept to the west. Vandenberg is in a historic district and isn't coming down for offices, housing or anything else. Whatever happens here would need to include that building. I think he was talking about incorporating Vandenberg into that plan. GR Town Planner, what do you think of expanding historic districts into East Hills, and Easttown? I think that a Conservation District would suit Eastown. East Hills is a great place, really the best pace in GR. I am a little biased working for and living int he neighborhood. Check out the neighborhood website at www.easthillscouncil.org, we are still developing content for it but there is much good info. Much of the sucess of East Hills has been the advocacy work by residents and the NA, which launched great ventures like: SEED - which restored houses and the Wealthy Theatre; ArtWorks - which is now thriving at the UICA; and of course the Center of the Universe!! New projects include: Trees Please and effort to plant 300 trees in East Hills and Midtown; great Neighborhood Events in collaboration with our business districts; and continued advocacy for our residents and businesses. We have lived in East Hills for almost 9 years (doesn't seem that long) and we love it here. We have seen it go from not-so-good to what I think is really the up and coming place to live in GR. We live in the area of Lake and Eastern, which is a little distant, but still walkable from the commercial areas of Fulton/Diamond and Cherry/Lake/Diamond. I really would like to see more owner occupied homes in the neighborhoold, however. Most of the homes in our immediate neighborhood are multi-unit rentals, but if people who lived there owned them and put some effort into them, they would really look nice. One thing East Hills lacks, I feel, is real retail. There are many nice shops and restaurants and we frequient them, but I would like to be able to walk to buy just about everything I need from groceries to hardware to a bank. It is really sad to have to get in the car to get something when you know that at one time it was all right around the corner. You are correct to say that East Hills and the entire Uptown District needs more local service-oriented businesses to meet the basic retail shopping/service needs for the 20,000 residents in Uptown (Census 2000). More local service-oriented businesses create jobs and neighborhood economic stability.